Philippine Airlines Promo 2019 - 2020: PAL Upgrade Promo for Miles!!! PAL Upgrade Promo for Miles!!! Philippine Airlines Promo 2017: Upgrade Now and Earn as much as 75% More Miles! 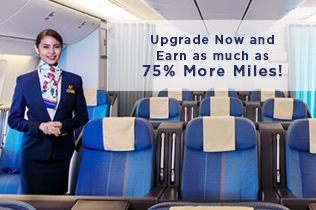 Upgraded passenger shall earn up to 75% more miles on business class instead of the original ticketed economy class. 1. Passenger must be a Mabuhay Miles member. 2. Miles must be credited to the member’s Mabuhay Miles account. 4. Passenger whose original ticketed booking class code is E T U O and upgraded to Business Class through the myPAL Upgrade program shall earn the corresponding mileage on “Z” booking class code. 5. Should there be any other flight segments in the PNR, it shall follow the mileage accrual of the original ticketed class of service. 6. Crediting of miles can only be done once the flight segment has been flown. 7. Please allow at least 48 hours for Miles to be automatically credited to the Member’s Mabuhay Miles account. Otherwise, standard retro-crediting procedure shall apply. 8. Mabuhay Miles and myPAL Upgrade Terms and Conditions shall apply. 9. Offer is subject to change without prior notice. PAL x Star Cruises Fly Cruise package!